Red Sunset Ceramics: Gearing up for Fall shows! Gearing up for Fall shows! Fall is here. As your have probably noticed, I struggle with consistently posting on my blog – as the last post is from JUNE! I started a post in July and then got sidetracked, so I apologize for the delay in communication. 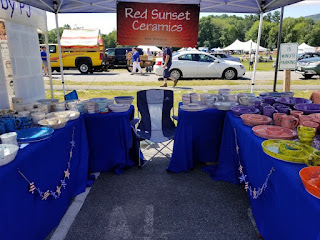 I really would like to do a better job of updating followers about what Red Sunset Ceramics has been up to! My plan at some point is to turn this blog into a functional site where you can order and purchase pottery (AND I can still have a blog area where I can post updates and news). My husband, Dave, is a web developer and has plans to make me an e-commerce website… now to just make that dream a reality! :) The plan is to have that up and running by Spring, so… fingers crossed?? So last summer I did 2 shows over the summer, and this year I added in 4 more (two large, two smaller) for 6 total. It was a challenge at times to keep up with the demand and need for stock with the shows (as well as with the local shops I am currently in!) 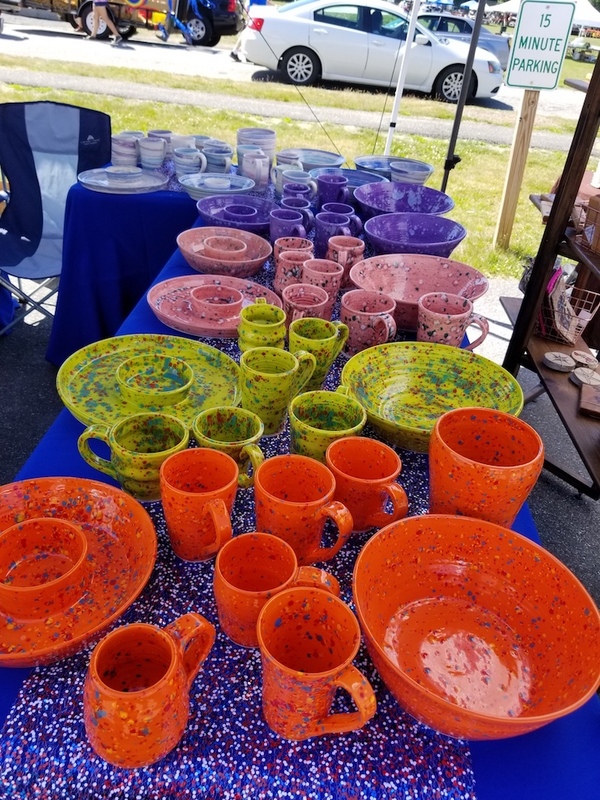 so I did end up throwing almost every day, and my kiln got a work out with 4 – 5 firings each week! 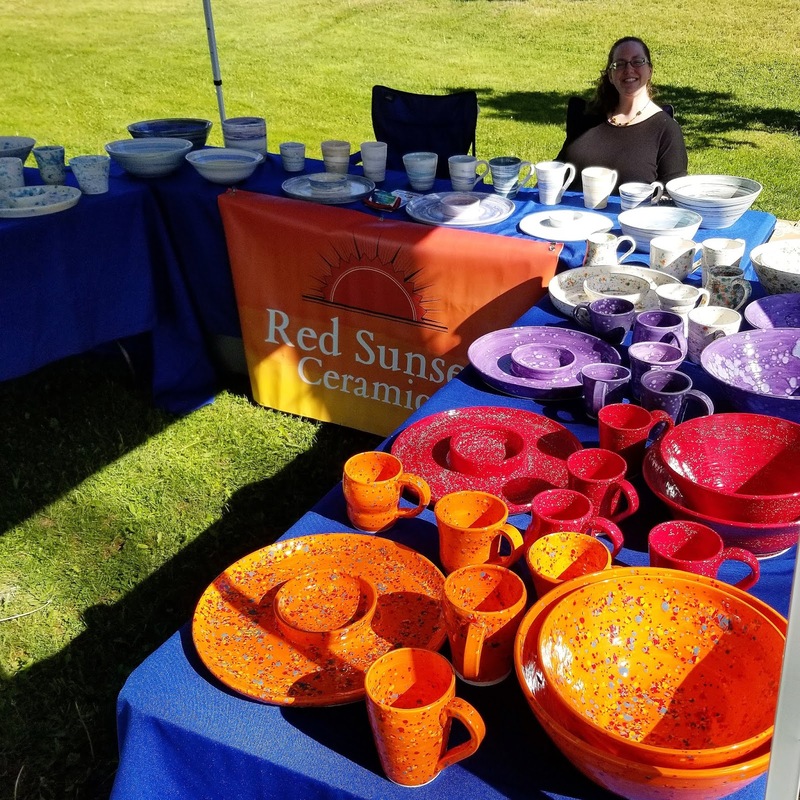 We did end up experiencing some issues with my kiln over the summer. 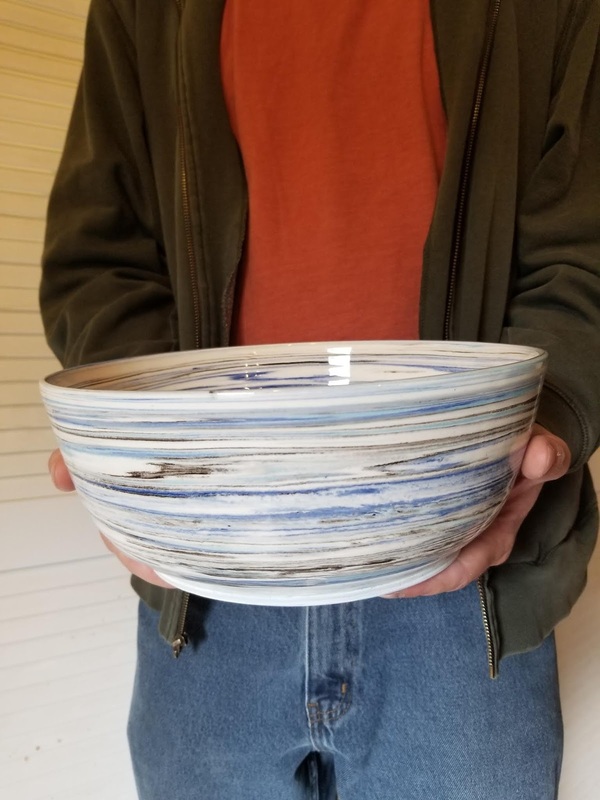 We purchased the Evenheat kiln used online from an individual (who had purchased it used online from someone else…) and it does not have a manual and appears to be likely 30+ years old. (Good longevity at least!!) 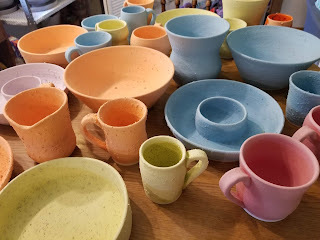 We started experiencing that the kiln sitter was not triggering off, so the pieces were overheating – glazes were runny and streaky, and bisque pieces were coming out warped and wonky. 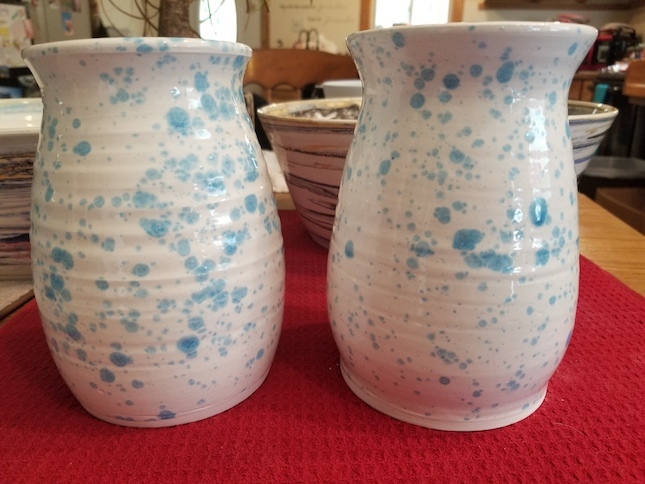 We cleaned it out some and adjusted a couple of the pieces and it seems to be doing better (although is still not always shutting off at the expected time), but all in all we decided to order a new kiln. 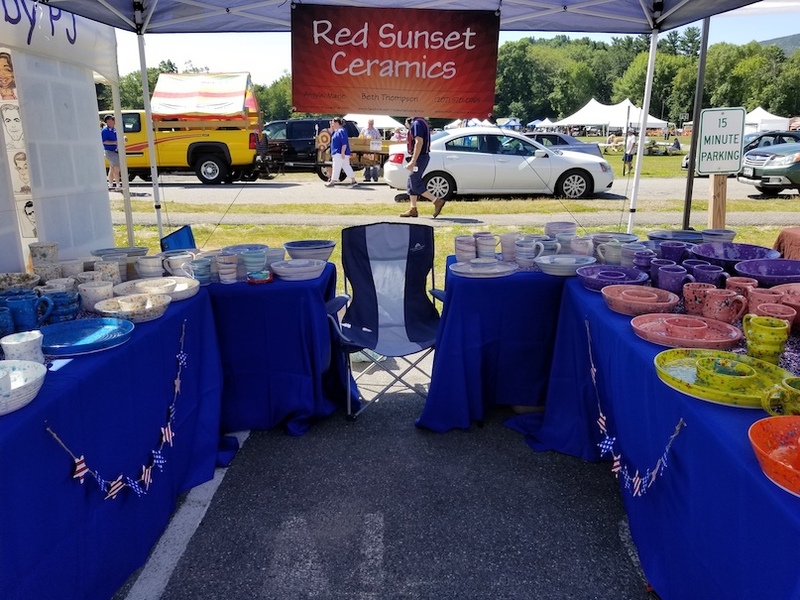 I qualified for a business loan to purchase a new kiln (Because jeez, my business is just starting, I do not have an extra $3,000 laying around!!) 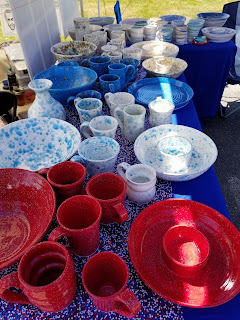 and was SUPER excited to take the time to research kilns and think about sizes, etc. 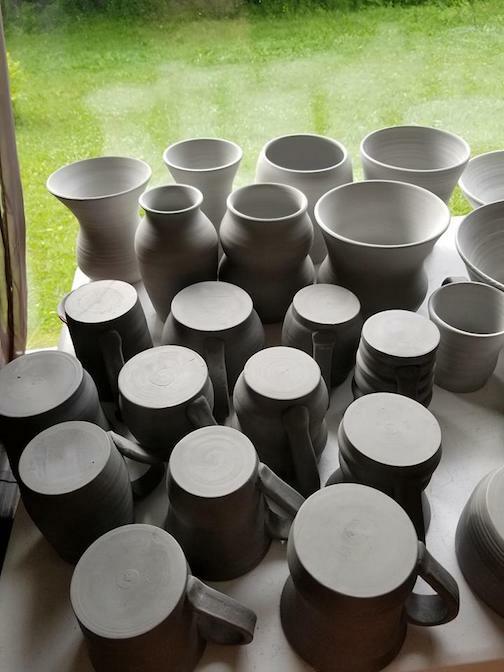 Currently the kiln I have can manage low fire (Cone 06 – 04 range) as well as medium fire (cone 5 – 6 range… although I have never tried that). 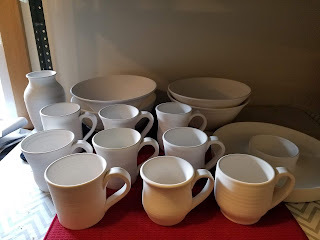 One of the things I wanted if I was going to purchase a new kiln was the OPTION to do cone 10/porcelain. Not that I have specific plans for that, but the option is nice. I also wanted more space. I know there are larger kilns in which I can fit more pieces. So I researched what my options were. I knew my kiln was not HUGE, but did not realize that it only holds 2.7 cubic feet, which is really not a lot when you think about kilns! So the new kiln I selected is a Skutt (because, yeah Skutt!) that can fire to cone 10, AND can hold 8.1 cubic feet of pottery. WHAT WHAT? Yep, it is awesome. I also ordered a set of kiln shelves with it and stakes to hold the kiln shelves. 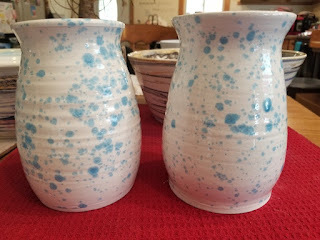 I mean, I have some of both at home, but these ones will be made to fit the new kiln exactly, so that is great. I ALSO optionally upgraded the kiln from a digital screen to a touchscreen that is wifi enabled, i.e., it can tie into the internet and comes with a downloadable app that I can monitor the kiln from on my phone!! I can even tell it to start or preheat, etc, from my phone! It is AMAZING. 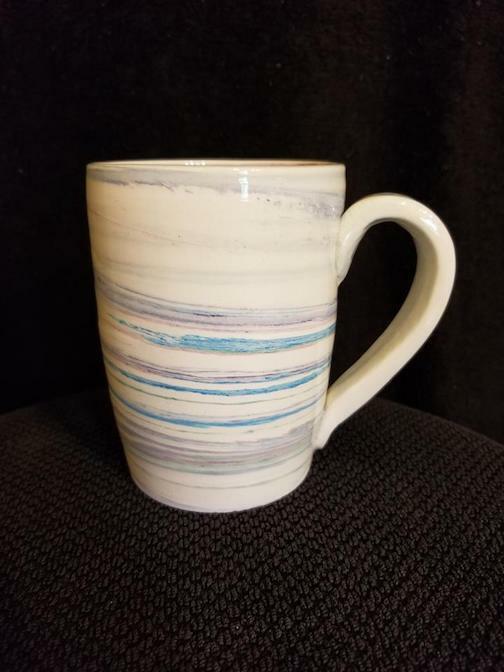 I am SUPER excited for it to arrive – the combo of a new toy combined with an unreliable old kiln makes it so much more difficult to be patient. I ordered it 5 weeks ago tomorrow. They said when it went through that it would take 4 – 6 weeks. I had hoped for the shorter end of that estimate, but we are where we are. I actually just sent out an e-mail to my contact asking if there is any news. Fingers crossed!! 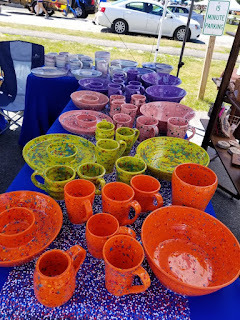 I have several large shows coming up so having the new kiln in place could REALLY help with that, especially since I do not have the same availability for firing now that I am back at work. I researched the new kiln – it has pre-programmed settings for firings, so I load the kiln and say, “slow fire” and it does a greenware to bisqueware fire that takes 12 hours. 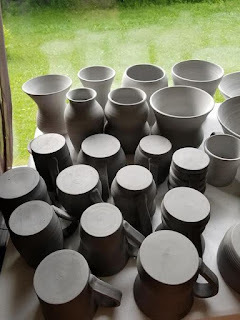 If I do a bisqueware to glazeware firing that is a medium firing, and takes 7 hours. There is also the option of fast fire, which is what you would use if you were doing decals, which I am excited to have the option to try. So all in all, super pumped for this to happen! I am going to make a separate post after this that lists my upcoming shows for winter. Hope to see you there!